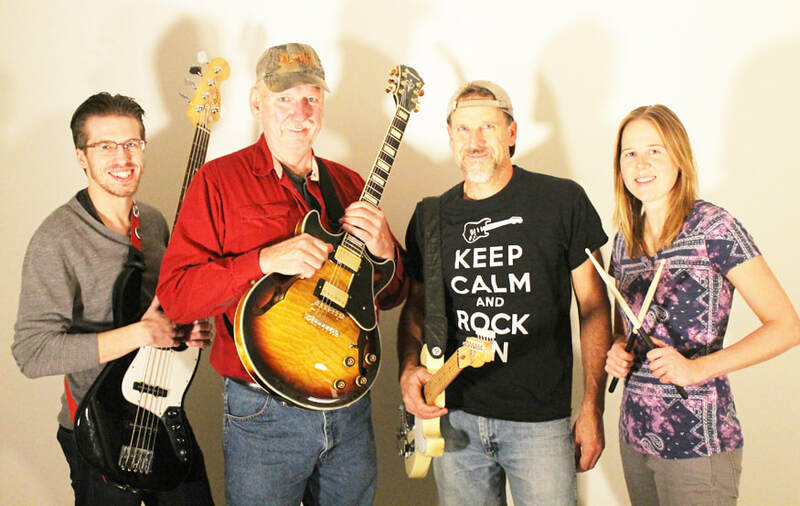 Rock On features Jules Rancourt on guitar, Katie Rancourt on drums, Bernie Walling on guitar and Tom Jordan on bass. If you enjoy retro-Rock music from the 1960s and ’70s and like to dance, the Great North Woods Committee for the Arts invites you to the Colebrook Country Club on Saturday, Nov. 3. That night local favorites Rock On will be turning out the hits from yesterday.? The show begins at 7 p.m. and the Country Club will have the dance floor down and ready to roll. Rock On features Jules Rancourt on guitar, Katie Rancourt on drums, Bernie Walling on guitar and Tom Jordan on bass. Jules has been a veteran of the music scene for decades, starting off with rock music of the ’60s, ’70s and ’80s, exploring country music in the ’90s, and returning to vintage rock with the creation of Rock On. Jules is joined by longtime collaborator Bernie Walling of Bloomfield, Vt., who brings his surf guitar licks out in full force. Tom Jordan, a member of multiple area bands, holds down the basslines, and the real fire in the group comes from the drumming of Jules’ daughter, Katie. Her aggressive performance of “Wipe Out” is always a crowd-pleaser wherever the band goes. Expect everything from The Beatles to Bryan Adams to Creedence Clearwater Revival, and everything in-between. ?Tickets are $15 and available at Fiddleheads, 110 Main St., Colebrook, online at www.gnwca.org or at the door. For more information on this and other GNWCA shows, find the Great North Woods Committee for the Arts on Facebook, visit www.gnwca.org or you can call 237-9302 or 246-8998.